Appletizer is organizing a spectacular trend seminar on the 11th of June with 3 top speakers! 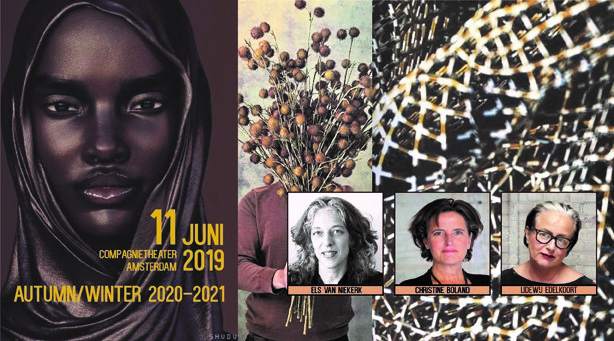 In the company theater in Amsterdam, Els van Niekerk, Christine Boland and Lidewij Edelkoort will take you on a full-day program (from 9.30 a.m. to 7 p.m.) to share their vision and quote influential trends for the A/W 2020-2021 season. Our first speaker, Els van Niekerk (Oltmans van Niekerk trend forecast agency), will open with her presentation FUTURE-PROOFING, ADAPTING TO A FOREVER CHANGING WORLD. Oltmans van Niekerk maps future developments, to inspire companies and to be able to develop a future-proof strategy. During her presentation Els van Niekerk discusses the four most important drivers for change towards 2021. The first is the idea of The Commons as an answer to systematic economic, social and democratic changes with a focus on the things that connect us and for which we are all responsible . Smart World shows how developments in technology and science will be able to redesign and improve our lives, many of these new technologies will blur the boundary between nature and technology. Fantastical Futures is about new worlds and the unlimited possibilities of digital design and Calm down questions our modern society and the human condition. How can we be strong, grounded, flexible and open in turbulent times? The Future-proofing presentation zooms in from macro trends to new product development, materials and colors. After Els van Niekerk, Christine Boland will set the stage with her presentation BEING HUMAN. Trend analyst Christine Boland is able to distil relevant trends from a multitude of information. From there, companies determine their policies and products and services are formed. Her method is characterized by a special, effective approach: from zooming out to zooming in. By first zooming out at the macro level and then zooming in to the product level. By clustering themes, Christine creates a relevant coherence in the themes. In her presentation, she argues that when the boundary between people and technology becomes ever greater further blurred and speech-driven [emotional] artificial intelligence is going to tell us how we feel and what we need, what distinguishes people from machines? What makes us unique? What gives a counterbalance to too many "online, digital, virtual, algorithms, robotization and AI"? That question is central to this equally confusing and exciting time of transformation. Design language is the first to formulate an answer. Archetypal human traits are being dissected, cherished, magnified, mixed and redesigned. Creative, inventive, and mysterious. In a formal language that is alternately romantic, poetic, bizarre, rebellious or provocative. Or an alchemy thereof. And then it becomes really interesting. Because that is precisely the essence of what makes us unique as humans. In her presentation - BEING HUMAN - all these facets come together in one way or another in five clear statements, each with a clear underlying motive. Lidewij Edelkoort represent the afternoon program with her inspiring presentations. Li Edelkoort is a valued inspirator all over the world and has in recent decades been able to attract large parts of the Dutch lifestyle industry to her seminars in Amsterdam. She is known for her amazing visual material and fantastic ability to always be at the forefront of trends, colors and materials. With her presentation BROWN AGE the importance of brown is explained and the quote is: "Warmer then gray, better then black and stronger than white, these new tonalities express the need for nature and earth in a subliminal and abstract manner", including everything. She talks about the tendencies and influences of this movement. Colors and color combinations are highlighted. Lidewij herself about her trend book Brown Age: “The importance of brown comes with the need for abstraction, for finally growing up and for leaving stories behind. Materials are judged on their own merit, clothing built for their own function, details designed for their own expressive power; create a spherical and cultivated style of clothing. Restructuring versus deconstructing, transforming a more positive period. Also a reconsideration of the fashion system and its rhythm. Textiles will contain certain key qualities such as corduroy and velvet, moleskin and denim, brushed cotton and felted wool, leather and nylon and teddy and terry cloth. All matter must be tactile and vital. " In the second part of her presentation she tells about the developments within Casual Wear and discusses her new Lifestyle book. Where she used to talk about Sportswear, Li now talks about Casual wear. “Times are changing and that also applies to casual wear, activewear, workwear and all other expressions of casual wear. For the first time in fashion history, they are merging with each other and even with fashion itself to create a new hybrid category that I now call recreation. The term feels new and fun because it says what it's all about; People take the time to rest and recover, and clothing takes the time to evolve, all in the process of being recreated. To illustrate how creativity will help us enjoy leisure time with our hobbies, activities and sports. You can attend this fully catered day for €495,- p.p. (excl. VAT). We also give you the opportunity to attend the morning or the afternoon program only. The morning program with Els van Niekerk and Christine Boland costs €295,- p.p. (excl. VAT). Lidewij Edelkoort wil take care of the afternoon program. The costs are €375,- p.p. (excl. VAT). You can find the full schedule here, and register today!